Adrian Schlemmer is a world leading designer, researcher and expert in all matters relating to high quality Japanese hairdressing scissors. From his experience as a scissor manufacturer in Sydney Australia for 10 years to working as a consultant for over 20 of the world's scissor factories Adrian is acknowledged as a market leader. Having trained over 50 sharpeners worldwide and supplied sharpening equipment and expertise to many scissor manufacturers, Adrian commitment to the ongoing advances in technology and quality of the highest level is undiminished for over 25 years. 1989 - Adrian Schlemmer founded Sharpline Scissors Pty. Ltd. in November 1989. Starting as a scissor sharpener and using German style techniques. Adrian quickly realized that a market existed in Sydney for Japanese style sharpening. 1991 - Adrian's first trip to Japan. 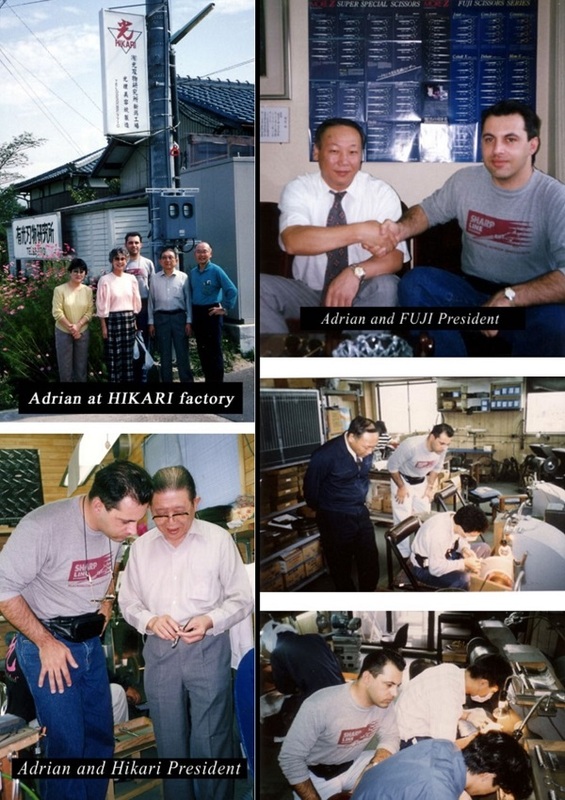 As a distributor of Fuji brand and Hikari brand scissors in Sydney, Adrian was privileged to train in sharpening techniques in both of these factories. Adrian also spent some time in Japan's largest OEM scissor factory. 1994 - Sharpline produces the first hand made Cobalt alloy hairdressing scissor in Australia in April, the Stellas scissor range debuts at Hair Expo in June. Another trip to Japan and to England for Salon International. 1995 - Adrian's first trip to Korea ( and another trip to Japan ) at the invitation of Korea's largest OEM scissor factory. Time is spent developing the new "SL" scissor range utilizing Japanese parts and materials. Later in the year Adrian works with the Korean factory manager in Sydney to develop advanced finishing techniques. 1996 - Sharpline introduces the "SL" scissor range, the Slice scissor range and the Royal scissor range in co-operation with factories in Korea and Japan. All these scissors have been purposely designed to compete in the Australian scissor market and distribution grows to northern N.S.W. , Western Australia and Victoria. Sharpline produces it's first scissor sharpening machine. 1997 to 2002 - Adrian has spent many years as a consultant and designer for scissor factories around the world including Germany, Japan, Korea, New Zealand and others. Adrian has also individually trained over 50 scissor sharpeners in Australia (many from oversea including the USA, Canada, New Zealand, U.K , Taiwan, Korea and Singapore ) in the same techniques he has trained in and taught numerous scissor factories. 2013 - Scissorworld moves to 243 Pyrmont St, Pyrmont, suite 148 . Adrian continues his commitment to the serious haircutters in Sydney with a quality Sharpening service and continued sales of the World's best hairdressing scissors. Sharpline grows to 9 distributors Australia wide. 2014 - Today Adrian moves to Kawagoe, Japan to take up a new role as head designer and Export agent. As such Adrian has designed scissors, including full ranges, for over 10 different companies. Over 20 years as a Martial Artist with shodan (black belt) or better grades in Muso Jikiren Eishin Ryu, Toyama Ryu and Nakamura Ryu Battodo and Iaido. Founder of the Japanese Sword Society of Australia. Founder of Sydney Token Kai Study Group on the Japanese Sword. Member of various Japanese and American Japanese sword research groups.